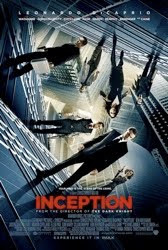 JB returns so he and Patrick can engage in a spoiler-heavy discussion of Christopher Nolan's 2010 masterpiece Inception. Hear them complain about the film's cold literalism, quibble over every minor flaw and dump all over the movie...IN YOUR DREAMS!! Because actually they love it. i am all in favor of spoilers in these f'ings, but i am going to try and hold onto my load for a couple days until i see inception on saturday (i will try, maybe i will just think about baseball or something...). anyway...looking forward to blowing it on monday. Your last theory blew my mind, Patrick. And even though I planned on seeing it again, I'm going to see it again even harder now. I actually almost wish I hadn't listened to the podcast until after seeing it a second time. I don't put much stock in that theory, Jennifer; it was just something I came up with on the fly. As someone pointed out (Steve? ), it wouldn't make much sense for Saito to be on the phone. See it again. See it hard. Then listen the podcast again. Listen hard.